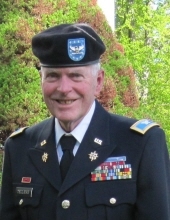 David William Tellman, 80, a courageous leader with a sharp wit and a generous heart who found many ways to serve his country, state, community, and the natural world, died in his home at the end of The Lane in Bethlehem, NH on Saturday, January 19, 2019. Dave was born in Traverse City, MI on March 13, 1938 to Ralph Livingston Tellman and Ruby Jane (Cash) Tellman. At the time of his arrival, his parents lived in Gaylord, MI, where Ralph worked at a Civilian Conservation Corps camp as a bridge construction engineer. Dave and his family moved several times, which would become a theme through his life until he found the perfect place to settle in New Hampshire. He grew up in Kingsport, TN, Lansing, MI, and North Olmstead, OH, where he graduated from North Olmstead High School in 1956. Dave met Tanya Stempel at Michigan State University and they were married on March 28, 1959, in Darien, CT. Dave was graduated in 1960 with a BA in Divisional Social Science and minors in Physical Science and Education and a commission as a 2nd Lt from the Army ROTC program. He also received his secondary teacher’s certificate. In 1971 he received a MAT from University of Missouri-Kansas City. While he never taught school in an official capacity, he was a devoted educator who encouraged younger generations (his sons, granddaughters, and great grandchildren included) to get out in the woods and learn about the natural world. Dave and Tanya had two sons, Bill (born in December 1959) and Ted (born in November 1961). Dave entered active duty in the United States Army in 1961 and retired with the rank of colonel in 1989. Much of Dave’s career remains a mystery to his family, as he operated at highly classified levels in military intelligence during the Cold War. While Dave served in the Army, the Tellmans lived at military bases in Maryland, Massachusetts, New York, Kansas, West Berlin, Augsburg, and Sinop, Turkey. Dave’s time in Turkey as the Sinop Base Commander and senior American dignitary in northern Turkey was the pinnacle of his career and there he met people who would become lifelong friends. Dave and Tanya operated as a team through their marriage, first in raising and supporting a household during Dave’s career, then pursuing a meaningful life full of contributions to their community in New Hampshire. While they didn’t move there full time until 1990, they bought their first property, perched on the town lines of Whitefield and Bethlehem, fifty years ago in 1969. It might be easier to list the organizations in which Dave played no role over the past thirty years since his retirement. In addition to serving in several municipal volunteer positions with the Town of Bethlehem, he also worked with state and non-governmental organizations, particularly in the fields of forestry and forest land management, education, wildlife and plant conservation, and hobby rock and mineral collecting. He was also an engaged member of the Whitefield VFW Post 10675 and was the Whitefield Memorial Day Parade Marshal for over a decade. As owners of forest land in six New Hampshire towns and operators of a tree farm that used best stewardship practices, the Tellmans hosted tours of their properties and were recognized several times as outstanding tree farmers in the state and region. Dave was a collector of special things and a consummate hobbyist. He loved old (and new) farm equipment, stamps, and unusual gem and mineral specimens, practiced lapidary and fine wood-working, and each year pressed cider from the apples he and Tanya harvested from their orchards. Perhaps Dave’s favorite way to decompress in the evenings was to sit in his leather recliner surrounded by at least two attentive dogs and feed them carrots and radishes. The Tellmans had a long succession of family dogs, always well-trained but often a bit strong-willed and each with its own inimitable personality. Dave was excited to teach his grandchildren and great grandchildren anything they wanted to know about the outdoors: how to drive a Gator, lawnmower, or excavator, how to safely shoot a rifle, when his special black raspberry patch was ripe for picking, and how to cook perfect pancakes at Camp Jack (the secret is bacon grease). In the last years of his life, Dave’s memory and then his body gradually ceased to function, but he never lost his sense of humor. He was always quick to respond with a laugh and a retort to jibes from his family and caregivers. Dave is survived by Tanya; sons Bill (wife Debbie) of Brevard, NC and Ted (wife Kathren) of Rosemount, MN; granddaughters Kirstie Doar (husband Rob and children Isabela and Mateo), Julia Tellman, Catrina Tellman and Emily Tellman; brother Stephen (wife Gaynelle) of Ridgway, CO and Puponga, SI, NZ; niece Erika Bohn of Montrose, CO; and dog Victry. He is preceded in death by his parents Ralph and Ruby, his sister, Suzanne Megahan, and a daughter-in-law Susan Scott Tellman. Dave stayed at home until his death, and the Tellman family would like to extend gratitude to the caregivers who helped Tanya maintain Dave’s quality of life until the very end: Cathy, Penny, Chris, Crystal, Sue J., Tori, Cheryl, Cassandra and Sue S. were at his side, even through ice and snow. The family also received essential support from North Country Home Health and Hospice, especially Jenn, Linda, Darlene, Roxi and Corenna. Memorials may be made in Dave’s name to North Country Home Health and Hospice, 536 Cottage St. Littleton, NH 03561. "Email Address" would like to share the life celebration of David William Tellman. Click on the "link" to go to share a favorite memory or leave a condolence message for the family.